Gigabyte / Aorus is well known for their reliable motherboards and video cards. Like most companies, they are slowly diversifying their catalog branching into other markets; today they are expanding their product line into memory. I believe they are the first motherboard manufacturer that is daring to step into the memory market. 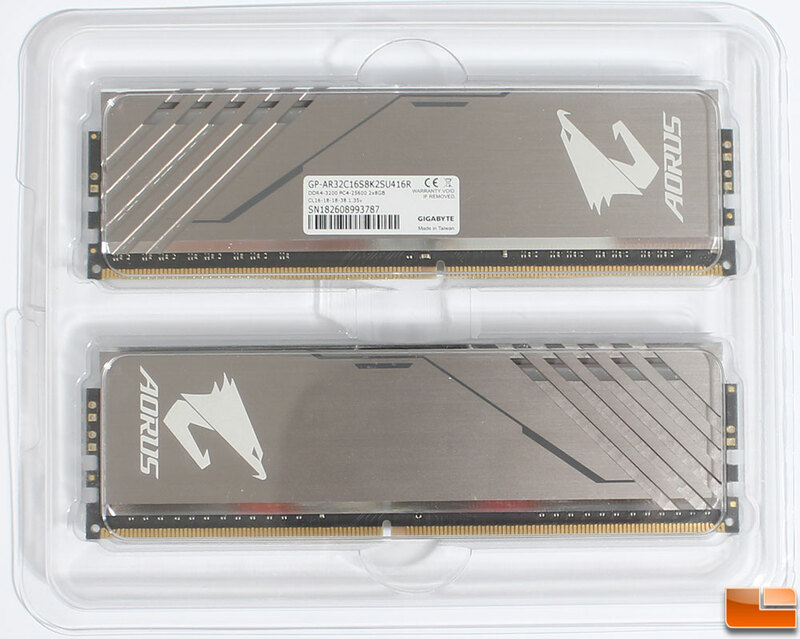 As it is their first memory kit, Aorus has released one version of the memory kit, at the popular 16GB size (2 x 8GB). 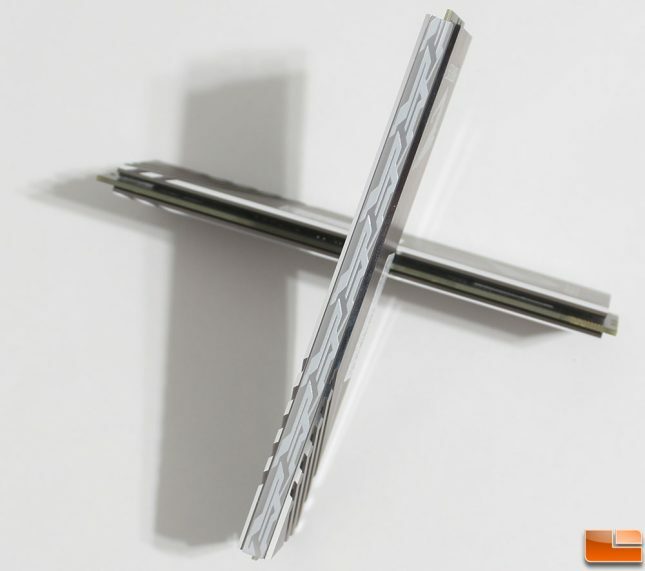 At first glance, their first memory kit looks impressive, it has a sleek brushed aluminum heatsink, impressive specs at 3200MHz with 16-18-18-38 timings, and even breaking into the RGB craze. Let’s take a quick look at the retail kit and the memory before doing some tests. The Aorus RGB 3200MHz 16GB memory kit that we are reviewing today is available under part number GP-AR32C16S8K2SU416R for $219.99 shipped. Inside the retail packaging is two different kits of the Aorus RGB memory. The first set is the actual memory, while the second set is a unique demo module that will allow you to populate all four memory slots that are commonly found on motherboards. For the most part, the two kits are identical. A silver brushed aluminum heat spreader with the Aorus logo on both sides, along with some accent cuts and holes that will allow the LED’s to shine through. On the surface, there are two differences in the kits. The memory kit includes a standard label identifying the memory, while the demo module points out it is the RGB Module. The second difference comes at the gold connectors, the demo module only needs a few connectors to provide power to the LEDs and the data connection to the lighting controller and the RGB Fusion software. Along the top edge of the memory is the Aorus patterned light diffuser. This light diffuser should evenly distribute the lighting from the five RGB LEDs. While the Aorus pattern gives it a unique look both while the LEDs are shining through and while the system is off. Thaiphoon Burner is showing that the Aorus RGB DDR4 memory kit is using Samsung K48G085WB-BCPB memory IC’s and the modules are single rank. 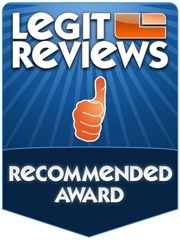 They are rated for a base speed rating of 2133MHz with a minimum timings of 15-15-15-36-50. 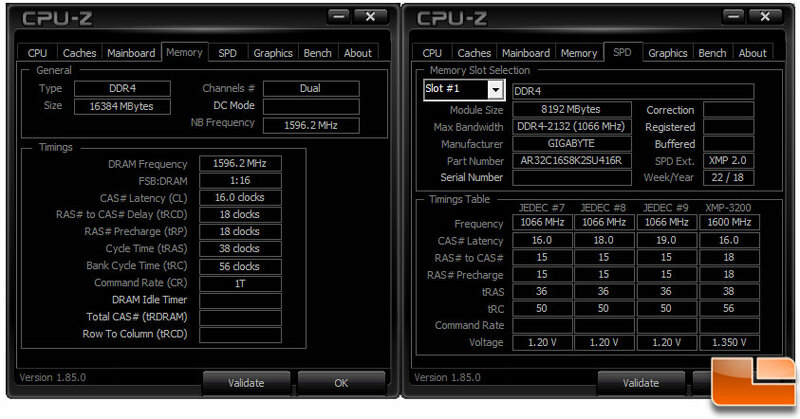 However, Aorus has configured the XMP to run at 3200MHz with 16-18-18-38 timings @ 1.35V. Aorus backs the memory with a lifetime warranty. After installing the memory, you can configure the memory manually, or selecting the XMP 2.0 setting. 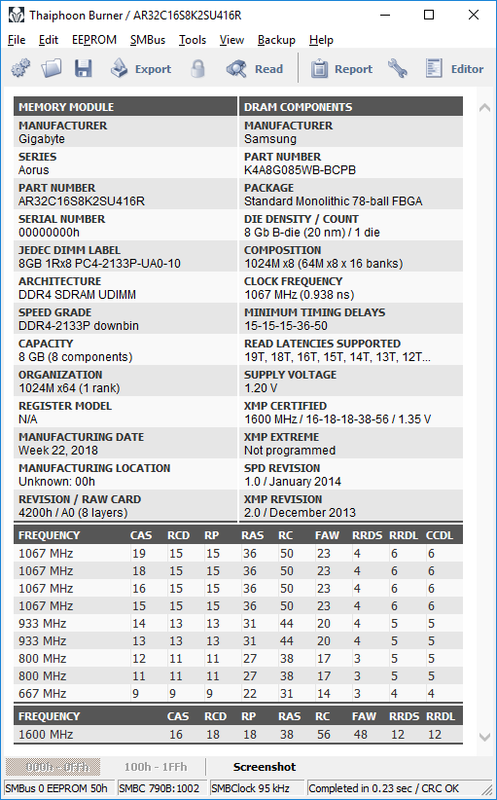 We selected the XMP setting, and found that it is running exactly within it’s specifications. 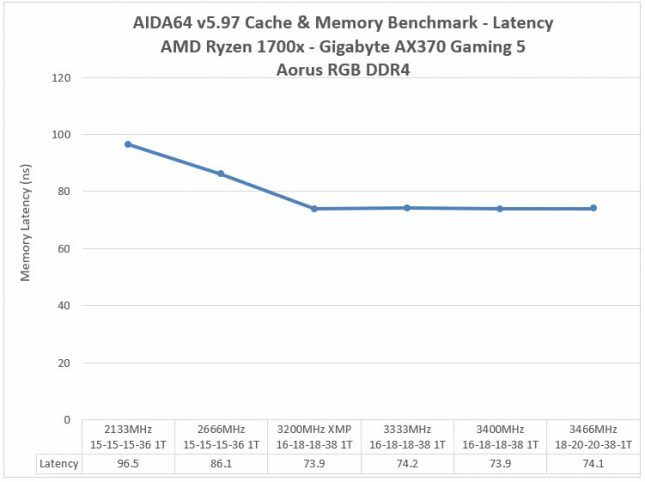 While we are testing this on a Ryzen based system, there was no rounding up of the latencies. 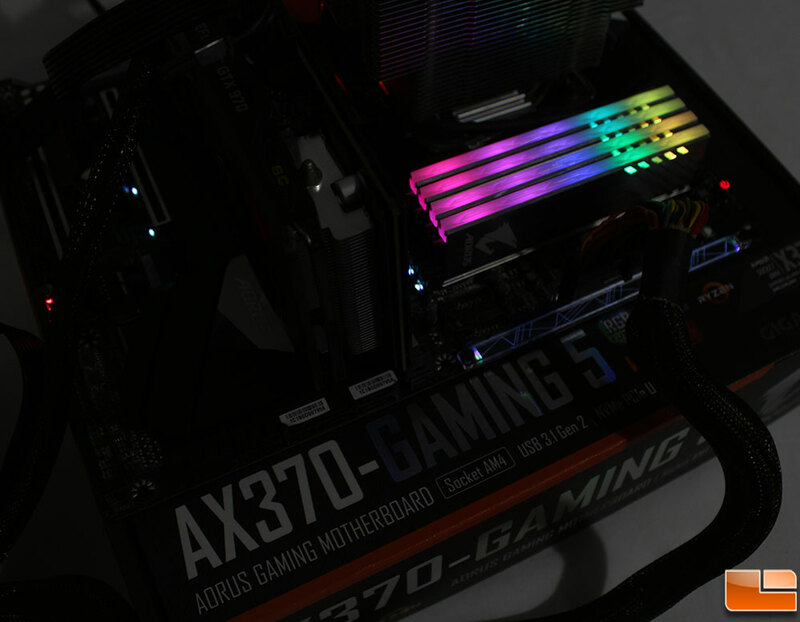 One of the features of the memory is the integrated RGB LED’s. 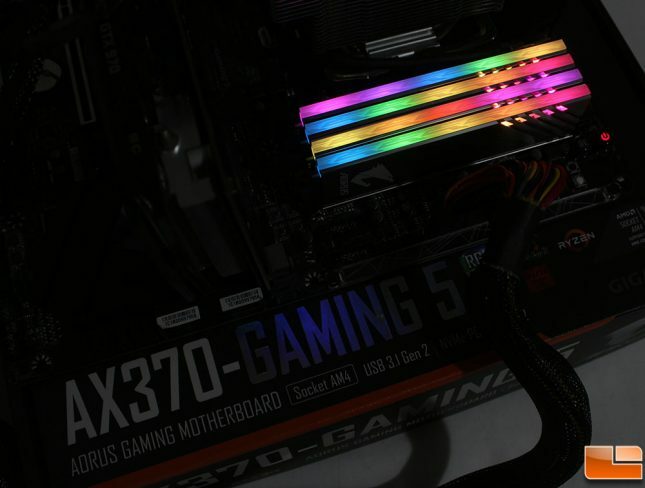 There are many different “standards” for controlling RGB lighting through the motherboard. 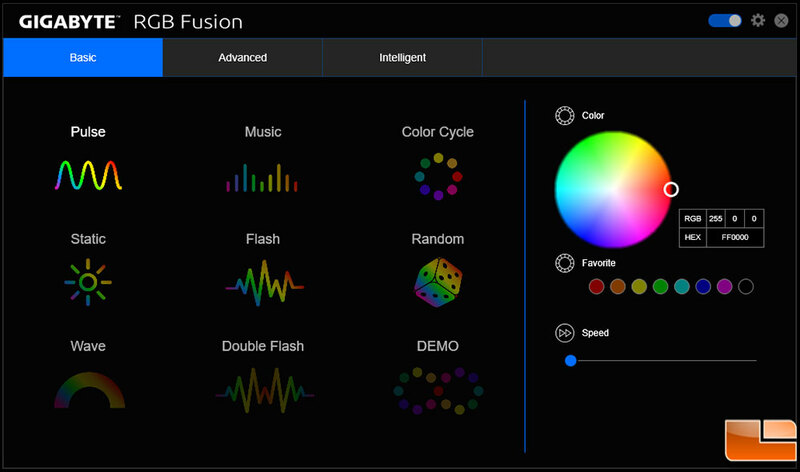 Gigabyte’s method is RGB Fusion, it is included in their App Center. Within the software you are presented with methods of controlling all the RGB features connected to your motherboard with a single click. In testing the functions, we found that not all the options in the basic method were available to be used (Wave, Double Flash and Demo were unavailable). I wasn’t able to keep the colors synched between the motherboard and the memory kit. If you go into the Advanced method, which allows you to control the RGB functions individually, the Motherboard RGB LED’s and DDR4 LED’s didn’t work well together, depending on which one you want to control, the other would go to a static color, with very low brightness. The initial lighting effect of the memory is for it to scroll through the colors. In the first picture, you can see the colors on the Aorus RGB strip look great; they are bright, vibrant, and lit pretty evenly. The Aorus patterned light diffuser does a great job at keeping the color even across the strip. After about an hour, the RGB LED’s are really out of sync; it still looks great though and some might prefer the randomness. During testing, we found that any lighting effect that changes color gets out of sync after a short period of time. We will be testing the Aorus RGB DDR4 memory kit on a Gigabyte AX370-Gaming 5 motherboard, with the AMD Ryzen 7 1700x. 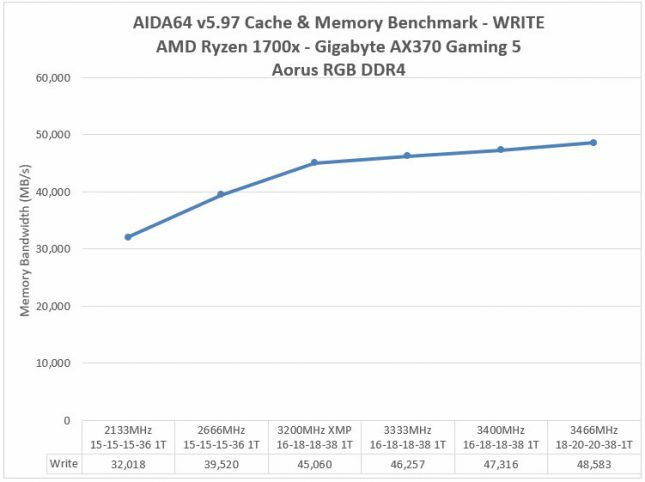 The AX370-Gaming 5 has been updated to the latest BIOS F23f and will be run at base clock speeds. The rest of the test platform includes the Corsair H100i AIO Liquid cooler, EVGA GTX 970SC graphics card and a Seasonic 650W power supply. A fresh install of Windows 10 v.1709 and AIDA64 v5.97 will be used to test the performance of the memory which will be tested at the base 2133MHz, and the XMP 3200MHz speed before we begin to overclock the memory to see what we can squeeze out of it. 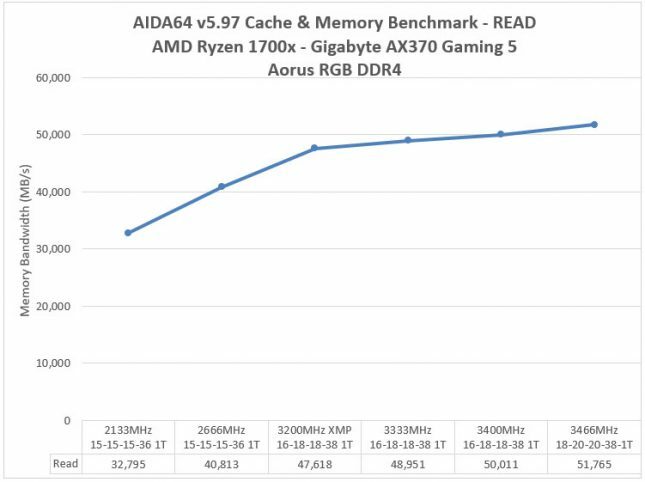 The results of the tests show that the Aorus RGB DDR4 3200MHz kit performs as we would expect at the stock speed. Overclocking it was rather easy, we were able to keep the XMP timings of 16-18-18-38 up to 3400MHz simply by increasing the voltage to 1.40V. We had to loosen them just slightly in order to get it to 3466MHz, along with another voltage bump to 1.46V. Overall, as the speed of the memory increased, we saw a fairly even increase in performance scores. For the read test, we saw the scores go from 47,618MB/s at 3200MHz to 51,765 MB/sat the maximum overclock of 3466MHz. That comes to a 9% increase in performance for very little effort. Gigabyte / Aorus knows how to build reliable computer hardware, they are one of the top tier manufacturers world wide of quality motherboards and video cards. Turning their attention to memory, their first entry into the world of enthusiast memory shows that they are aware of what enthusiasts are looking for. The Aorus RGB Memory kit is composed of 2 8GB memory modules that feature SamsunB-Die memory IC’s that are known to be reliable. Running at it’s rated XMP speed of 3200MHz it performed admirably, with a simple increase in voltage to 1.4V we were able to overclock the memory to 3400MHz, around a 6% increase in clock speed which resulted in a 5% increase in read performance. Increasing the voltage to 1.45V and loosening the timings slightly, we were able to get a 3466MHz overclock, an 8% clock speed boost, which provided around a 9% increase in read performance! Not too bad at all. When purchasing RGB enabled memory, you’re probably concerned about the appearance of the memory. With the brushed aluminum heat spreaders, with the RGB LEDs disabled, the memory would look great in almost any system. Then when you enable the RGB function, the memory comes to life. The LEDs are bright, while the light diffusing bar does a great job at keeping the light even from the five RGB LEDs. 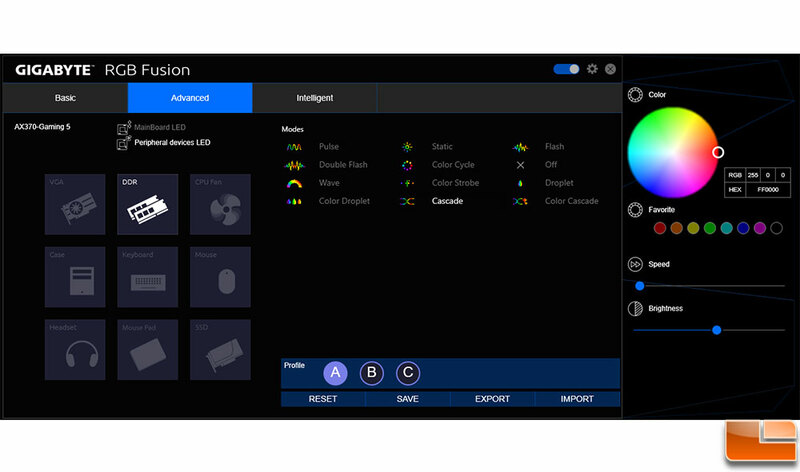 Using Gigabyte’s RGB Fusion software, you can control any Gigabyte product that has RGB LEDs and sync up the colors. Gigabyte / Aorus has also included a second pair of memory that can be used to fill in the other two memory slots on most motherboards; this is the first time this type of product has been included (or even made available to the end user). The RGB Modules shows that Gigabyte is as concerned about how your system looks as you are. The one downside to the Aorus RGB DDR4 memory kit is that it is only compatible with RGB Fusion, it doesn’t include support for Asus Aura or MSI Mystic Light. However, those with motherboards that do not include RGB Fusion, you can use the RGB Fusion Link software to manage the RGB LEDs. 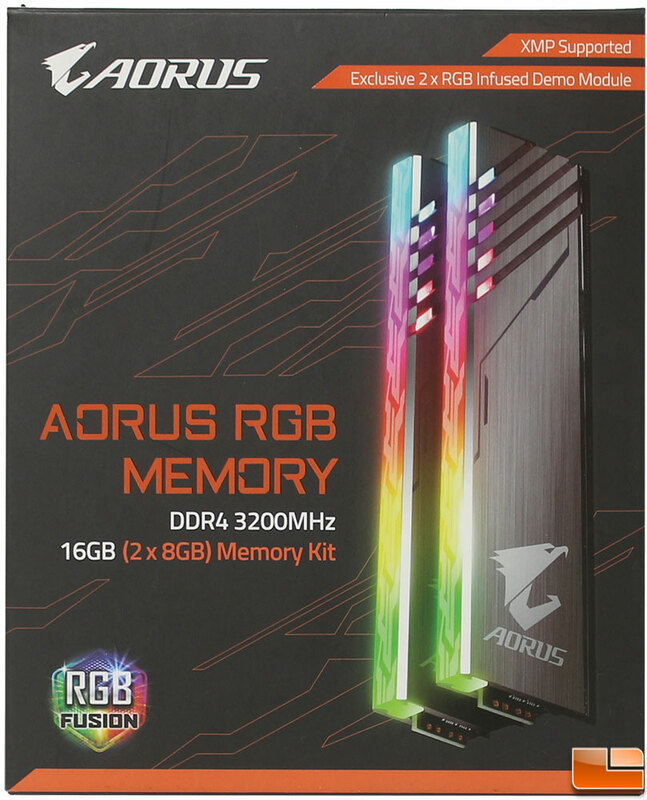 The Aorus RGB Memory kit (GP-AR32C16S8K2SU416R) is currently available at many online retailers for $219.99 with free shipping. While Gigabyte is well known for their reliability, if there should be a problem Gigabyte has you covered with a lifetime warranty on the memory. With the introduction of the Aorus RGB DDR4 memory kit, you can now have a computer made entirely of Gigabyte / Aorus hardware; well, will the exception of the processor. 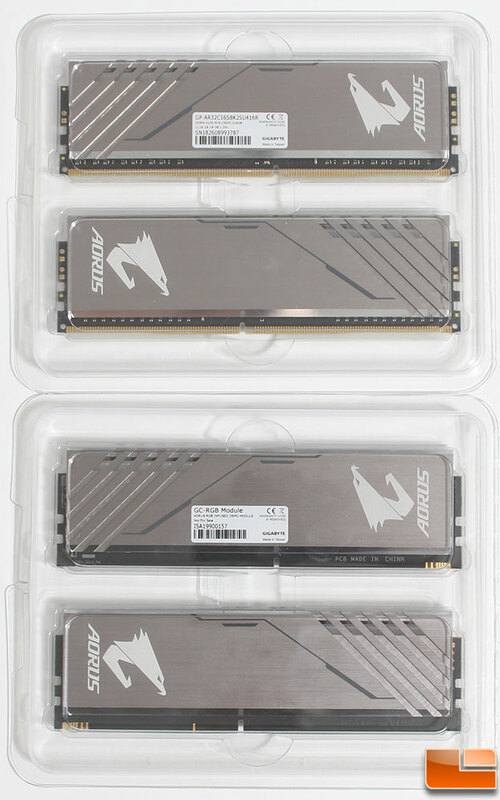 Legit Bottom Line: For their first entry into the enthusiast memory market, the Aorus RGB DDR4 3200MHz 16GB memory kit is very impressive. 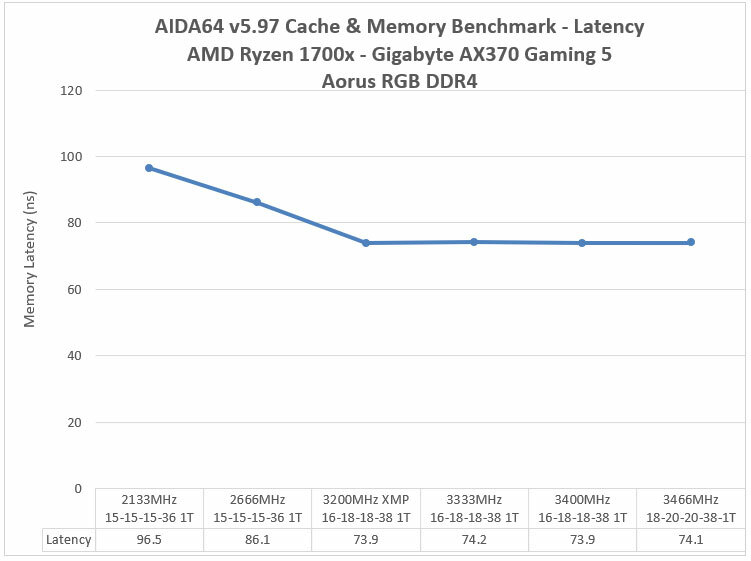 It performs exactly as we expected, and can easily be overclocked. Toss in the second set of RGB modules, and you have an incredible memory kit that is hard to beat.